Saturday April 6th 2019 will see the third North American Carp Conference to be held at the Elks Club, 44 Maynard Rd in Middletown CT. It runs 10am - 6pm and features Vendors, Speakers, Raffle Prizes, Rig & Bait Clinics, Newcomer Advice plus Lots More! We’ll even have our popular ‘Live Links’ with UK Carp Stars and others! The only ‘Carp Conference’ to be held in North America it has proved it to be an outstanding success and brings fellow carp anglers together from all over New England and further afield. The Elks Club Bar will also open & serving food and drinks for NACC attendees Don’t miss it! Tickets are available in Advance: CAG Members $5.00 & Non Members $10.00 Tickets will be available online shortly! Under 16’s Admitted Free when accompanied by an Adult with a ticket. Tickets also available on the door. Please provide your real name, not forum name. 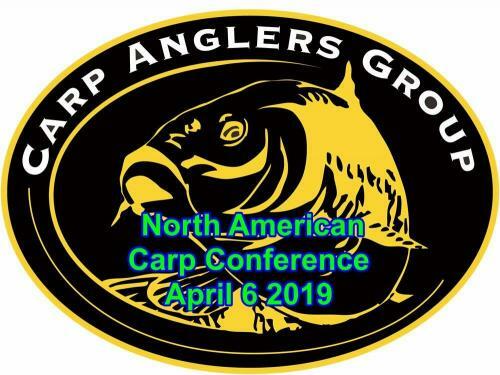 Saturday April 6th 2019 will see the third North American Carp Conference to be held at the Elks Club, 44 Maynard Rd in Middletown CT. It runs 10am - 6pm and features Vendors, Speakers, Raffle Prizes, Rig & Bait Clinics, Newcomer Advice plus Lots More! We’ll even have our popular ‘Live Links’ with UK Carp Stars and others! The only ‘Carp Conference’ to be held in North America it has proved it to be an outstanding success and brings fellow carp anglers together from all over New England and further afield. Tickets will be available online shortly! Under 16’s Admitted Free when accompanied by an Adult with a ticket.